Wendy and I are in Hanoi now (my second trip to Vietnam, her first). It's a vibrant, thriving place that reminds a little of Paris. When I was here before, I realized that the Vietnamese had long ago moved past their wars of independence (1945-1975). Indeed two-thirds of the Vietnamese population has been born after 1975. But I was curious about the American pilots that had been shot down and imprisoned in the infamous "Hanoi Hilton" — in particular John McCain. Above is a monument at Truc Bach Lake which the Vietnamese put up to memorialize the shooting down of John McCain. The text reads (in Vietnamese) along the lines: "On October 26, 1967, Lt. John McCain in his A4 B1 was shot down in this lake." The image at the center shows McCain (hands raised) surrendering. McCain was fortunate. After he had bombed a power station in downtown Hanoi, his plane was shot down and he crashed in the Truc Bach Lake (shown behind the monument in the above photo). Had he crashed on land, he would have been killed. North Vietnamese civilians went out to the center of the lake and pulled McCain out of the wreckage. McCain was badly wounded. Shown above is a North Vietnamese doctor treating the surviving crash victim. McCain then was put in the infamous Hoa Lo Prison. This ghastly, brutal place was built by the French in 1896 to incarcerate and torture Vietnamese felons and subversives. If you've seen the 1973 film Papillon, you've got an idea what Hoa Lo was like. The colonial French were good at prisons. Hoa Lo even had its own guillotine (which was used often). Between 1964 and 1973, Hoa Lo was used for imprisoning American pilots who were shot down. Shown above is a cell door. 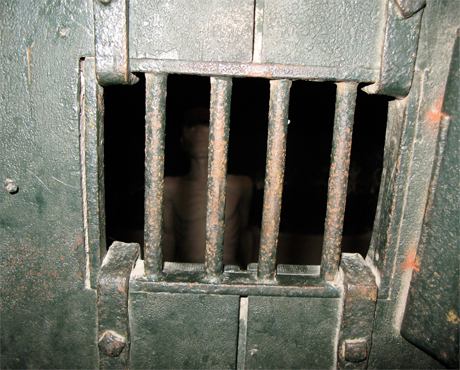 Shown above is a typical Hoa Lo cell which would have been shared by four or five American prisoners. John McCain spent five and half years here, and was released with the other POWs in 1973. In the spring of 2000, he returned to Hoa Lo. There are photos of his return on display at the prison. Having put his POW experience long behind him, McCain did not seem bitter at all. Looking at the monument, before I read the description, I was surprised that the Vietnamese would memorialize their torture in showing him hanging from the ceiling. Reminds me a bit of the Persian empire displaying Crassus' vermillion-dyed and stuffed corpse like a chandellier in their diplomatic receiving hall. When you're the only superpower in the world, everyone revels in their little victories. Did any leftist anywhere, any time, during that era protest the treatment of American pows? Not with the shrill insistency that they protest waterboarding, I mean did they ever even mention it? Nancy: He's showing surrender. Actually McCain was too badly hurt to do anything like that. The VN were barely able to get him out of his aircraft. Stephen: Well, Crassus was a real prick. Of course in 1967, there were 2 superpowers. William: Not that I recall. Nixon won in 1973 (with Paris Peace Accords! ), that the N. Viet commies knew were a lie (their guy didn't accept the Nobel Peace Prize, Henry K did). The Dem Party of the USA then voted to lose -- by stopping the possibility of enforcing the Peace (in 1974) with US military, by cutting funds to our proxy allies the S. Vietnamese (in 74-75), which was followed by N. Viet commie victory. As the anti-war (anti-US victory) folk expected, and thus supported. What makes John McCain a hero? to prevent him from killing their people. What was McCain doing in Vietnam? He was dealing with those who wanted to, and thanks to Democrats succeeded in, killing off those who didn't want to become prisoners in their own country to Marxism/Stalinism, a killer of people much worse than Hitlerism. Next, preferably intelligent question, please. How stupid does this get? What makes him a hero? 1) You try to fly in the heavily defended environment of Hanoi without shitting your pants..Then go back and fly 22 more missions.. 2) He was tortured as a POW. He was offered the chance to go home ahead of the other POWs and refused, for which he was tortured some more. That makes him a hero to me! What was McCain doing in Vietnam? He was fulfilling his DUTY as a Naval Officer who swore an oath to "...support and defend the Constitution of the United States..." The President, Johnson, ordered him to bomb Vietnam. Well, no one ever said McCain was not a survivor. McCain was shot down from flying 1000 ft too low which makes the A-4 less able to make hard evasive turns to avoid SAM's. McCain had crashed a T-2 trainer jet when he was flying too low and his wing tip struck the ground; and a A-4 from hitting a low power line, again flying too low. The Navy wanted to give him a low rating thus ending his career however the USAF needed A-4 pilots and his father was an Admiral. Yes, you may call him a hero but at Brooks Army Hospital there were amputees and men with parts of their skull blown away on the ward (Ward 3-C, aka "Stump Ward")to which I was medivaced (I have a combat related severe disability but I do not call myself a hero. I saw men with massive stiching going across their body and men with huge q-tips where they once had a limb. They are heros as well as being democrats, minorities and even a few gays (at least one combat doctor). So don't get too self-rightous! McCain was & uis a War Criminal who should have been executed.